Using this guy with Lyra the Sunshard has created some interesting games where Finicky Cloakfield ends up buying me a whole extra lyra turn! A) Swap for The Black Knight. The deck originally called for it, but I decided leaving Confessor Paletress in was a better idea, and that Toshley was a better choice than BK. C) Find an alternative outside the last two. Which is why I'm thankful for this site. This card just might be pretty good now thanks to the Paladin and Mage quests. The card is a control card as spare parts really assist in that and so does having 7hp instead of 6 or 5 like most minions and that mana cost. Thinking about Toshley just makes me sad. He's cool and has a cool effect and wants to synergize with Archmage Antonidas soooooooooo badly but there just isn't a deck that really has room for him, particularly over Sylvanas Windrunner. Hopefully he'll one day find a home where he can truly shine. 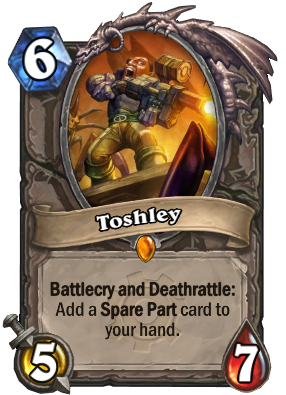 Toshley is fantastic in Mech or especially Tempo Mage decks. He's basically; Battlecry and Deathrattle: do something useful and put a Fireball in your hand. He only has 1 less Attack than the vanilla Boulderfist Ogre, so he loses very little for his effect, and trades very well. Is it a bad I Dusted him for a Glorious Golden Piloted Shredder? I mean... He doesn't really have any synergy (Other than Gazlowe) with mechs, does he?.. Toshley is incredibly good in certain decks. Piloted Shredder is a common, and although great, a gold version is a terrible trade for any viable Legendary. You should regret your decision. This card should see more play in Mage class with the new BRM card Flamewaker. His stats are pretty solid (kills popular minions like Emperor Thaurissan, Loatheb, Sludge Belcher ..) and the free spare parts will help. yay! just got his golden card from an arena pack. Obviously not a strong legendary, and certainly not a competitor to Sylvanas in most decks. Probably quite a few 6-drops that usually work out better for most decks also. Not convinced that Tosh is better than sunwalker for example. However, the spare parts do make him better than Boulderfist. The -1 attack usually doesn't matter, and the spare parts sometimes do. Especially stealth, rewind, reverse, and freeze can all be game-winning in the right circumstances. I just had the pleassure of stealthing Chromaggius against an unlucky mage, and the next round I had 2x loatheb and 2x keeper of the grove in my hand (after using wild growth to draw an extra card), not to mention that sassy 6/8 body still on the board. He would be awesome with just a small buff. Tried to build a Rouge deck uses spare parts... I don't think the spare parts would be just enough to use, while you still have to have a spell eating cards on board or in hand.